Jack O’Connell is often referred to as ‘rising star’ of the Brit acting school. He certainly shone in the efficiently menacing Eden Lake (2008), and the underrated tongue-in-cheek horror fun of Tower Block (2012), to name but two. Now he is earning lead roles wherein he can deliver on earlier promise. 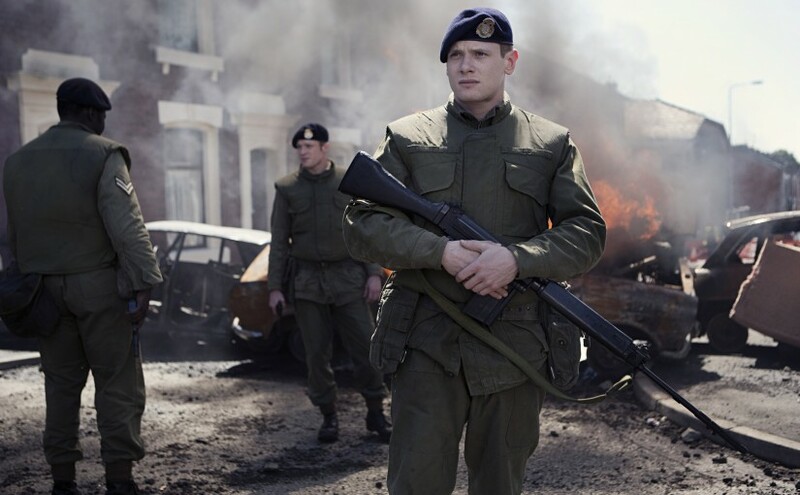 Hot on the heels of 2013’s prison set Starred Up comes ’71, first directorial feature of Yann Demange. It takes us right to the burning heart of The Troubles in Northern Ireland, seen through the reluctant eyes of an inexperienced rookie recruit. O’Connell is Private Hook, new soldier in training. His regiment is unexpectedly deployed to Belfast to lend support in the worsening tensions between Protestant and Catholic factions on the capital’s frontline. In the chaos following an eruption of latent violence, Hook is separated from the troops. Stranded, he finds himself in an unsettlingly domestic enemy territory formed of battle-scarred backyards and burnt out terrace blocks. Co-produced by Warp Films, curators of the superbly disturbing Dead Man’s Shoes (2004) and Shane Meadows’ sparky This Is England (2006), this is similarly gritty fare. It may share production DNA with these earlier works, but is an even more intense offering, a realistic reproduction of the mundane and brutal hostilities of recent memory. The colour palette is relentlessly dreary, all drab browns and dull oranges, from the dirty peeling patterned wallpaper, to the sodium streetlights that prefigure the flames constantly threatening to ignite. And when they inevitably do it is viscerally shocking. The minimal and brooding soundtrack (by the great David Holmes) rings with painful tinnitus after we are caught unawares, way too close to a pub explosion. The scene exemplifies a ground level handycam style, which achieves an almost abstract, sensuous submersion in the environment. In the harried chaos of the first act’s violence, the danger is that such immersion can threaten to become distractingly overwhelming. O’Connell is perfectly cast as the fish-out-of-water army recruit embodying both the untrammelled muscularity of a wannabe soldier and the fresh vulnerability of youth. In line with the overriding naturalistic tone, he has surprisingly little dialogue. The pivotal plot points are often played out through silent action, and are all the more powerful for it. But while Private Hook faces a lone battle for survival this is not a one-man show. Amid a staunch supporting cast, Sam Reid portrays a Lieutenant barely maintaining calm authority in such unfamiliar terrain. And Sean Harris is dependably terrifying as the shady army captain under cover, trying to maintain control of a critical situation. ‘71 is an emotive and savage drama, necessarily bleak and forbidding, but thoroughly gripping throughout. Choosing the year of the events as the title both dates the movie as historical drama and reminds us how far we have come in the following short decades. It also forces us to confront the disturbing truth that these darkest of days are in our very recent history.